FAQ – How to grade the condition of my stamps? Condition grading can sometimes be very confusing as it is a subjective evaluation and even veteran experts may disagree on some points. The overall quality must be taken into consideration before a grade can be determined. Many points must be examined in detail, both front and back, before a conclusion can be made. A close study of the centering, the perforations, the cancellation and the paper must be made in order to determine the presence of any hidden flaws. 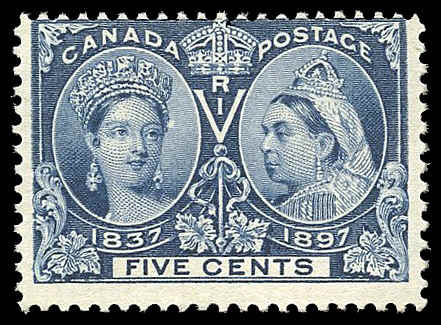 A very fine appearing stamp may under close examination be downgraded to fine or even to defect. This knowledge is necessary and very important as the grading of a stamp will dramatically influence the price of a stamp.For the purposes of this article, we will share with you the grading system of Arpin Philately, which is similar to the one used by The Unitrade Specialized Catalogue of Canadian Stamps. 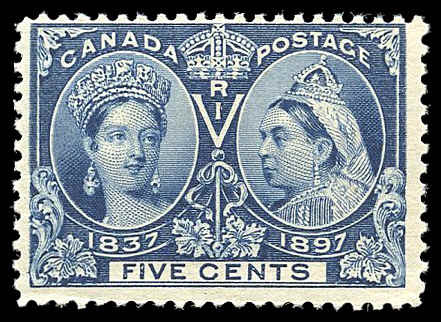 Extremely Fine (XF): These stamps are close to perfect without flaws. The image should be very well centered on the stamp with relatively even margins (the white space between the perforationss and the design) all around. Imperforate stamps will have even margins or some larger than normal margins. The colour of the stamp should be fresh and bright. Used stamps will have light enough cancellations so that the design of the stamp shows through clearly. Note: The printing methods of older perforated stamps were so haphazard that a perfectly centered specimen is sometimes impossible to find. Therefore the grading is more liberal on centering for these stamps. Four margins clear of the design will be considered an extremely fine stamp. Very Fine (VF): These stamps have designs that are slightly off center on one or two sides, but will present a well balanced appearance, again without any flaws. Imperforate stamps will have even normal size margins, clear of the design. 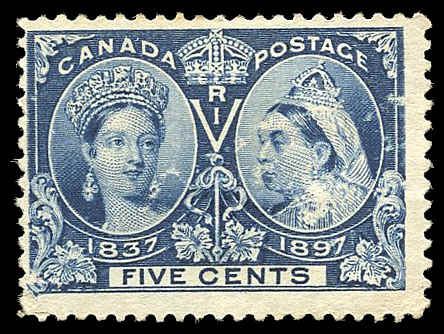 After 1951, most Canadian stamps are considered VF, since the printing methods were better, having been automated. Fine (F): These stamps have images that are quite off center, with perforations that are very close to the design but still not touching. There will still be a white margin between the perforations and the design of the stamp. The width of the margins of an imperforate stamp is generally narrower and the design may touch the edge of the stamp. Very early perforated issued issues may have one side with the perforations cutting slightly into the design. For a used stamp, the cancellation could be heavier, but shouldn’t totally obscure the design. 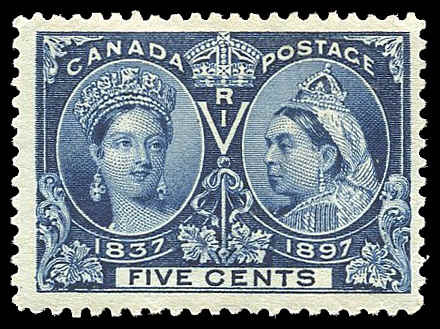 Very Good (VG): A VG stamp can have the image extremely off centre to the naked eye, with one or two sides of the stamp perhaps cutting into the design, with no margins whatsoever. For example, the perforations may have actually cut into a part of the image. 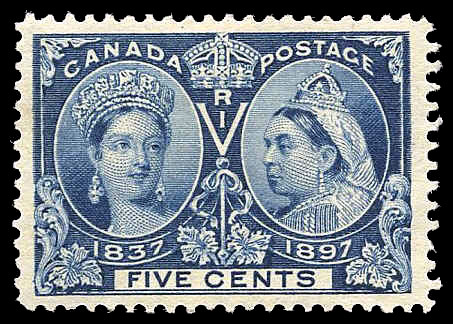 The colour of the stamp might be muddy or faded. If you have an imperforate stamp, there may be no margin on all sides of the stamp; the design of the stamp may have been cut into when trimming the sides, making it extremely off-centre. If your stamp is used, it may have a heavy cancellation that might even be a little messy. Defect (DFT): A Defect stamp is considerably less expensive and for obvious reason. If a stamp has missing or torn perforations, it is automatically a defect stamp. 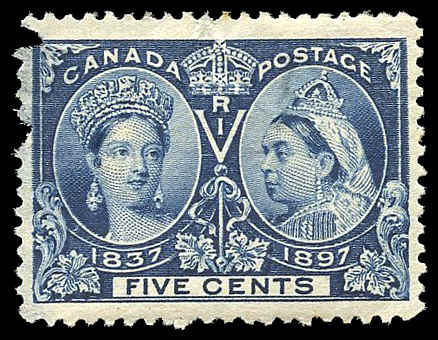 A defect stamp could also have a slight tear or have a pinprick hole, or the paper might be thinned out (it is good to check the back of the stamp to detect this, just hold it up to the light). Space Filler: This stamp is as its name implies; a stamp to plug a hole in your collection if you don’t really care what it looks like. A Space Filler will often have a piece missing or a large tear or a hole or several missing perforations. A Space Filler will be a less expensive way to fill that missing gap on a rare and expensive stamp. This can seem a little overwhelming at first, but with a little practice, in no time at all you can be an expert! In our next article, we will explain how to calculate the Never Hinged surcharge premium of Mint stamps. 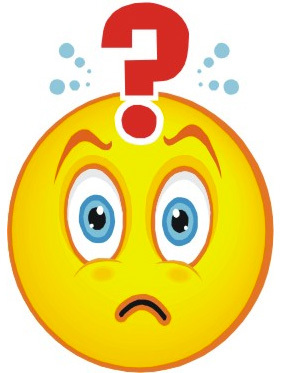 FAQ – How do I calculate the value of mint never hinged stamps?